Courtesy of SUNCHASE REALTY LLC. Under Construction. This spectacular NEW VILLA in the beautiful waterfront and gated community of Marina Bay offers the ideal blend of pure luxury and practical convenience 8211; over 2,300 sq.ft. of living space ALL ON ONE LEVEL, with an equal amount of parking and storage below providing a garage beyond compare! 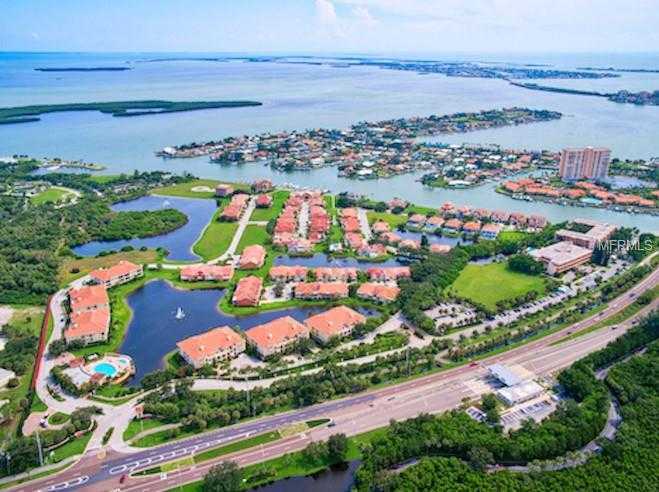 Marina Bay is located on Pinellas Bayway next to Eckerd College, just 5 minutes to downtown St. Petersburg, moments to world-class beaches and only 25 minutes to Tampa airport. This waterfront community features almost 2,000 8217; of intracoastal water (ICW) directly on Boca Ciega Bay. The beautifully appointed Lido Grande Villa model features a wide open floor plan, concrete block construction all floors, your own PRIVATE ELEVATOR from the garage level to the living level, 10 8217; ceilings with dramatic vaults in Great Room, tray ceilings in the Dining Room and Master Suite. Three bedroom, 2.5 baths plus Laundry Room and two outdoor terraces. Gas cooking, gas tankless hot water heater, and plumbed for GAS GENERATOR! Kitchen features a huge WALK-IN PANTRY, Cambria quartz counter tops, wood cabinets, and stainless steel appliances. Community amenities include 2 pools (one with geothermal heat), 2 spas, fitness center, clubhouse, fishing pier, direct access to Pinellas Trail, tropical landscaping, spectacular water features and fountains, an abundance of wildlife and so much more. Pet friendly, located next to Eckerd College. Deep water boat slip available. Gated, exclusive, incredibly accessible! Please, send me more information on this property: MLS# U8039610 – $849,000 – 18c Franklin Ct S, St Petersburg, FL 33711. I would like to schedule a showing appointment for this property: MLS# U8039610 – $849,000 – 18c Franklin Ct S, St Petersburg, FL 33711.